Stack the States is now available for android! Stack the States is finally available for the android platform! The android version contains the exact same functionality as the iOS version including the stacking game, 4 bonus games, flash cards and interactive map and creation of up to 6 player profiles. Stack the States for android requires android 2.2 (Froyo) or higher and is priced at $0.99. Stack the States is now available for Windows Phone! The title says it all. Stack the States is now on sale in the Windows Phone Marketplace! This is an exact port of the iPhone version of Stack the States and is currently on sale for $0.99. All of the features and bonus games from the original are included. More announcements will be coming later in the month. Stack the States needs your vote for the 2010 Best App Ever Awards! Good news! Stack the States has been nominated for “Best Kids App” in the 2010 Best App Ever Awards! It’s nominated in both the iPhone and iPad divisions so please vote for Stack the States in both places. Voting ends January 25th and the winners will be announced at the 2011 Macworld Expo. Click the link below to go to the iPhone division voting page, then click the orange “Vote!” button. Click the link below to go to the iPad division voting page, then click the orange “Vote!” button. STEP 3: Tell your friends to vote! I’ve just submitted my latest iPhone app, Stack the States, to the iTunes App Store. This time around I decided to try something different and create an educational app. The goal was to create a learning app that was actually fun to play. The object of the game is fairly simple. You are asked various questions about the 50 states including capitals, state shapes, abbreviations, bordering states, location on the map and even nicknames. If you choose the correct state, you get to actually pick it up, move it, rotate it and place it wherever you want. Your goal is to carefully create a stack of states that reaches the checkered line. Every time you complete a level you earn a random state. As you try to collect all 50 states, you can always check your progress on your personalized map of the US. All of the states you have earned appear on your map in their correct locations. As you earn more and more states, you start unlocking the three included bonus games: Pile Up, Puzzler and Capital Drop. Pile Up becomes unlocked and playable after earning 10 states. The object of Pile Up is to remove all of the states before they pile up to the top of the screen. To remove a state, simply tap the state shape whose name is displayed at the bottom of the screen. 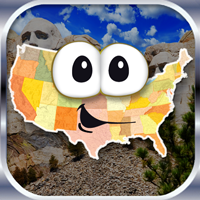 Puzzler is the second bonus game in Stack the States and is unlocked after earning 25 states. The object is simple, move the displayed state shapes around and put them together like a jigsaw puzzle. Puzzler is great for teaching and reinforcing the relative locations of the states. Capital Drop is the third and last bonus game in Stack the States. The object of the game is to match the states with their capitals. When you see a match, simply tap the capital box and the state shape in any order and they fly away. The game ends when a state falls off the bottom of the screen. Match as many states with their capitals as you can. Click here to see Stack the States in iTunes!